Healthy eating has always been important to me, which is why I became a registered dietitian. But I also think it's important to keep it real. My goal each night is a well-balanced, family meal. That means making food that everyone will actually eat, including toddlers. I keep meal planning simple, rotating through about 100 different core recipes that I know at least the majority of my family likes. I use a system my friend Brandi Nielsen helped me develop years ago. And it still works! I don't cater to picky eaters—this mama cooks once—but I also choose kid-friendly recipes over elaborate dishes. If my kids don't have to try something new every meal, dinner is much more successful. If I'm making baked ziti, which my toddler doesn't love, I make sure the side is something like green beans, which he does like, so he'll at least have something to eat. I also talk to my kids about food. I teach them that they are a steward over their bodies, and that they want to fill it with healthy food. We all have to eat, so I try to use this necessary thing as a way to learn other life lessons, like self control. I don't have an unrealistic set of restrictions surrounding fooI don't want food to become recreation or a vice. I plan dinner one month at a time. For us this means 23 meals, allowing for leftover days and a new recipe or two. I plan monthly because it allows me to organize my shopping better than if I were to plan weekly. I know what to stock up on at Costco and Sam's club, and then I can fill in with trips to a regular grocery store for produce and items I need in smaller quantities. It helps me save time and money. I'm not very techy, so I use scrapbooking materials to organize my recipes. When I make a recipe my family likes, I write the name of the recipe on the front of a card. On the back, I write a shopping list to go with the recipe. Some are handwritten, some typed. I don't include items that I always keep stocked in my pantry like spices, sugar, or flour. If the recipe is from a specific book or website, I include that reference on the front of the card. I have about 100 cards with tried and true recipes that we cycle through. When I try a new recipe, I don't add it unless at least a majority like it. I store my recipes in an accordion folder, in four categories: one with cards labeled with each month of the year, one with recipes I've used in the last month or two, one for vegetarian recipes and one for recipes with meat. At the end of each month, I look through the recipes I haven't used for a while and pick 24 recipes I'd like to make for the next month. I slide them into two vinyl photo protectors. Then, at a glance, I can see all the meals I'm going to prepare for the month on one side, and all the ingredients I'll need on the other side. I don't organize the meals into specific days of the month, because I like to keep it nebulous. Then I can decide which cards to used based on the schedule of each particular week. I usually use the cards to make a shopping list, but if I'm in a hurry, I can just take the cards out of the sleeves and bring them with me to the store. I also keep a running list of possible sides, so I can have those ingredients on hand too. I typically plan one main dish and one side for every night. I like to pack lunches for my kids so I know they're getting healthy, balanced meals, with things they actually will eat. 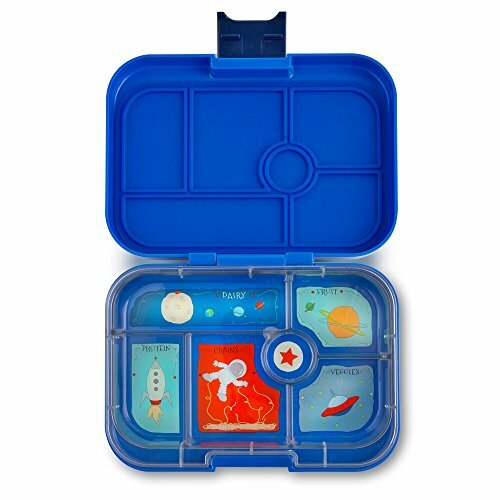 I use a bento box called a YumBox, with a different color for each kid. We pack them the night before. I'm trying to teach the kids to pack their own, but I often end up doing it after they're in bed. Each part of the box is already labeled with dairy, fruit, protein, grains and veggies, so I typically follow that guideline when I pack it. Two days a week, I send them with a thermos full of leftovers, such as fried rice, mac and cheese, or chili. When I send chili I also send chips and cheese and lettuce so they can make a taco salad out of it. 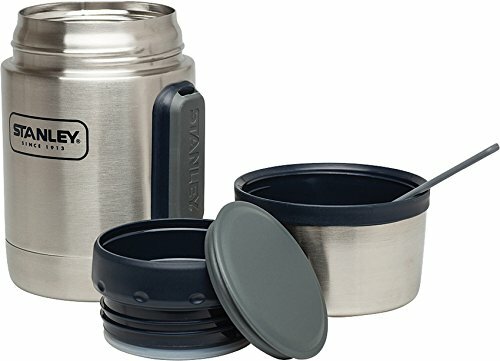 I bought them nice Stanley thermoses that actually keep the leftovers hot. My husband brings his lunch to work too. I pack up leftovers for him the night before, and keep them in a white basket in the refrigerator, so he always knows where to find his lunch. I send a snack with my kids to school, and I'll buy they chips or crackers or other snacks like that. I don't want to be too restrictive on what they can eat. I also give them a snack right after school. They can have one snack of their choosing After than, I require them to eat a fruit or vegetable. I keep a pretty fruit organizer from Crate and Barrel stocked with fruit for them to choose from, as well as fruit cocktail, carrots and celery and hummus or sesame salt carrots in the fridge. This way I can tell if they're legitimately hungry or just bored. 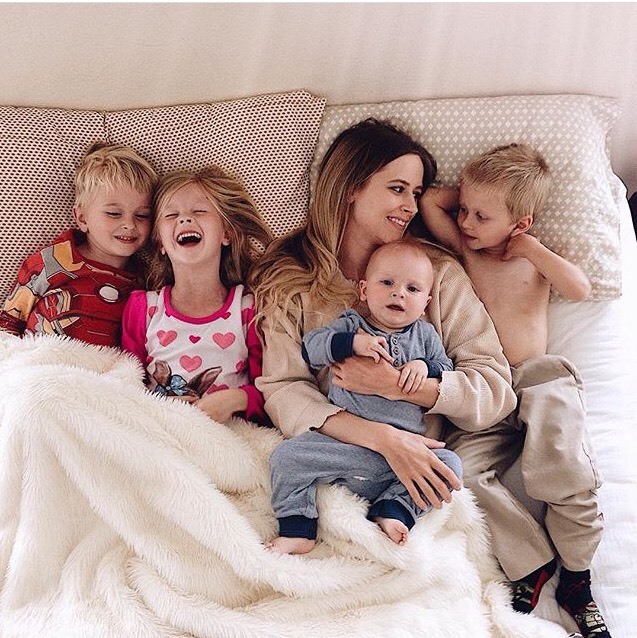 When I just had two kids, I'd shop every other week, but now that I have four, I shop once a week. I vary which store I go to each week, based on whether I need bulk items, smaller quantities or mostly produce. My monthly plan makes it easy to make separate lists for each place so I have what I need. Kara Farnsworth is a registered dietitian. She's committed to teaching her kids to eat healthy, but she's real about it and lets them eat real chips instead of kale chips.